The Australian Research Centre for Aerospace Automation, ARCAA, has launched a competition for students and hobbyists. 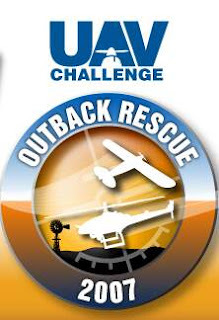 The UAV Challenge - Ouback Rescue will be held in Queensland, Australia in September 2007. The contest will have prize money up to $40,000 (US $30000) in categories of airborne delivery and search and rescue. There will also be a category for the best documentary film on how the participating team created their contest entry. The judging for the contest will be based on the performance of the unmanned flyer through a course as well as a report and presentation of the design. The vehicles will be limited in size to weigh no more than 100 kg (rotary) or 150kg (fixed wing) in the competition configuration. The contest is open to high school students only from the state of Queensland but to university students or hobbyists worldwide. A lot of people ask, what is the difference between the hexacopter and octocopter? The simple answer is Power. 8 engines means more thrust, longer flight times and heavier payloads. The Cinestar Hexacopter can be easily disassembled for travel but is also sturdy enough to sit in the back seat of your car between jobs.